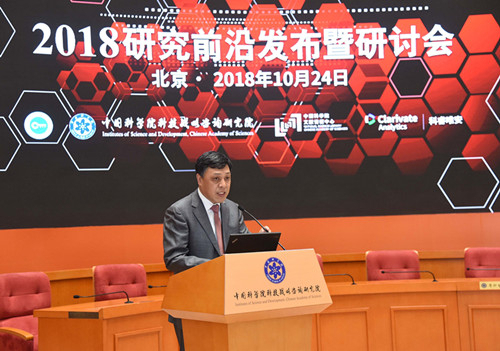 October 24, Research Fronts 2018 report was launched at Chinese Academy of Sciences, as a collaborative achievement of the Institutes of Science and Development (CASISD), National Science Library and Clarivate Analytics. 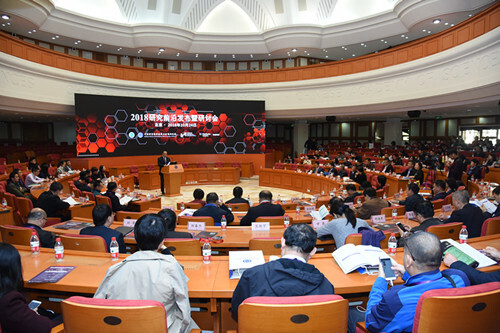 More than 300 scholars, research managers and information researchers has participated in the launch conference from over 100 government departments, research institutes and universities. 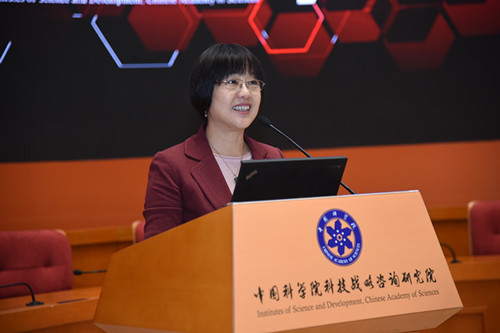 The launch conference was hosted by PAN Jiaofeng, the president of CASISD. 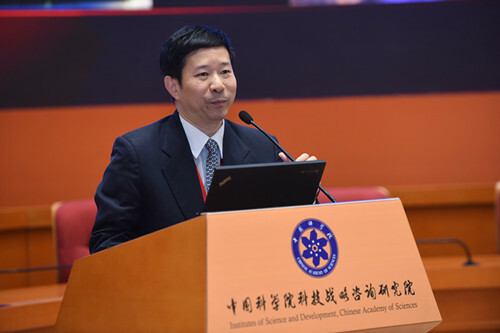 ZHANG Tao, vice president of Chinese Academy of Sciences and an academician, emphasized in the opening remarks that Research Fronts report is meaningful to provide insights into S&T development trends of by constant monitoring and scientific analysis, which is worth attention from the scientists of various fields. 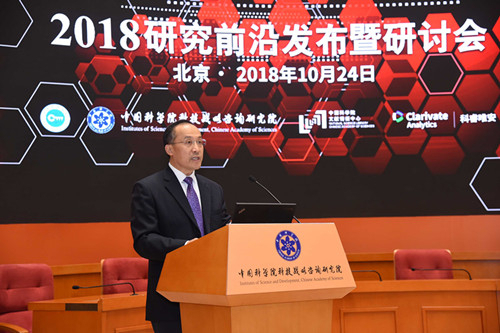 He anticipates the Research Fronts report would become a high-caliber product of S&T think tank, which can better serve the scientists and can be a strong support for national decision-making in future. Since 2014, Research Fronts report was released annually by CASISD collaborated with Clarivate Analytics, aiming at unveiling and analyzing the hotspots and emerging frontier in the basic science fields through big data and bibliometric methods, which has been aroused numerous attentions from global scientific and technological communities. In Research Fronts 2018 report, 138 key research fronts are identified out of 10 broad research areas, including 100 hot and 38 emerging natural and social science topics, based on the analysis of a cluster of highly cited papers over a period of last five years, by means of bibliometrics, information and big data technology, and by consulting experts in fields of science, information, policy and strategy. 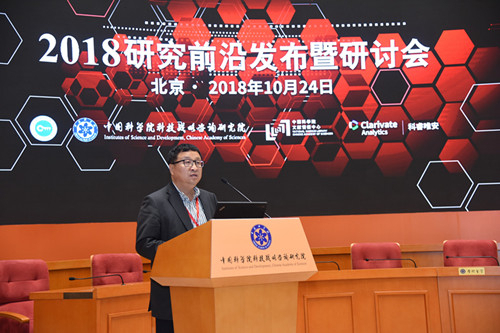 “Research Fronts 2018: Active Fields, Leading Countries”, another joint report, evaluates the performance of leading countries in those 138 research topics, revealing that China leads the world in 32 topics ranking the second to the United States leading in 82 topics, then followed by the United Kingdom and Germany in 4 and 6 topics respectively. 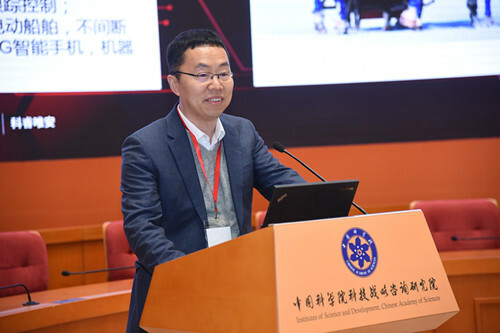 The most active research topics of China locate in two fields of Chemistry and Materials Science, and Mathematics, Computer Science and Engineering; the fields of Agricultural, Plant and Animal Sciences, Ecology and Environmental Sciences, and Geosciences are relatively active; compared with last year, great progress has been made in the field of clinical medicine; however, the research activity in Astronomy and Astrophysics remains insufficient. 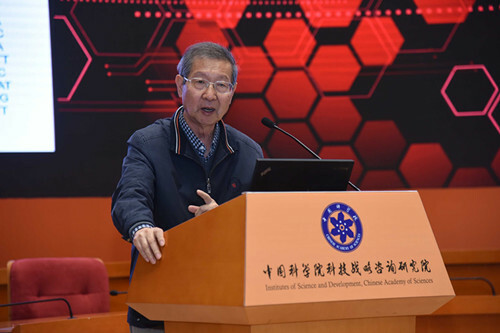 In order to present the main progresses and trends of science and technology (S&T) frontier to the public in an academic and professional way, professor CHEN Runsheng, an academician of the Institute of Biophysics of CAS, was invited to give a speech on “Dark Information in the Genome”, professor LIU Yizhi from Zhongshan Ophthalmic Center of Sun Yat-Sen University introduced his research on “Lens Regeneration Using Endogenous Stem Cells”, and professor LI Yanhong from the Institute of Physics of CAS also presented his research on the topic of “Analysis of the Development Trend of the Next-Generation Lithium Battery”, and then further in-depth discussion was conducted between the scientists and conference participants. 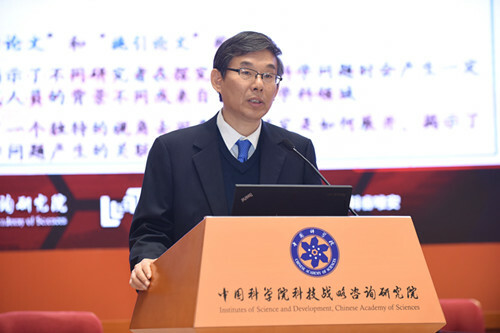 ZHANG Tao was giving the opening remarks. 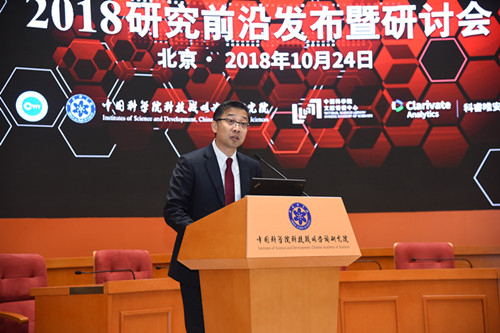 PAN Jiaofeng was hosting the launch conference.